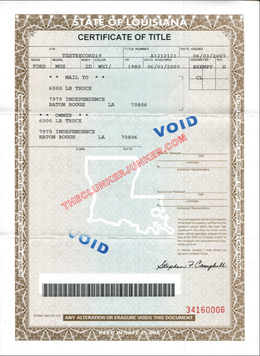 We buy junk cars, vans, SUVs, and trucks and pay cash in Louisiana! Do you have a used or junk car sitting around your yard just taking up space and rusting away? Do you need some extra cash? (who doesn’t?). The Clunker Junker pays cash for cars in Louisiana and we pick them up and tow them away completely free of charge. You won’t even have to leave the comfort of your home! Forget about wasting your time creating a bunch of ads on Craigslist or Ebay. We buy junk cars in Louisiana today and pay you cash right on the spot. If you are looking to sell your junk car in The Bayou State, look no further! We want to “buy you” car! (We love puns here at The Clunker Junker). At 24 miles long, the Lake Pontchartrain Causeway is the longest bridge in the USA! If your old clunker is in such bad shape that you’re not sure it can make it from one side to the other without breaking down, it’s time to call The Clunker Junker. Rather than try and drive it off the side of the bridge and into the lake, we will buy your junk car and take it off your hands. We’ll also fill your pockets with some extra cash for your junk car in Louisiana! From Bossier to Lafourche, we buy junk and used cars, vans, trucks, and SUVs in all of Louisiana’s 64 parishes. Whether your car is broken, wrecked, rusted, or even just slightly used, we will be happy to make an instant offer right here, right now. It’s finally time to sell your junk car, so let us make a “Louisiana Purchase” and haul it off your property free of charge. We’re the experts at Bayou State junk car removal. We buy junk cars all over Louisiana, and do the owners the favor of towing them to the auto salvage yards. We’ve created a highly efficient junk car buying service in Louisiana. We’ve broken it down into three simple steps. It’s never been easier to get cash for junk cars in The Big Easy! 1. What kind of junk car are you selling? The humidity causes extreme damage to the cars in the Boot, so we’re accustomed to seeing a lot of rusting vehicle. Cars that are in better condition might sell for a slightly higher price, but it doesn’t make a difference to us. If you have a junk car, we’ll take it off of your hands faster than you can order a shrimp po boy. We pay top dollar for junk cars in Louisiana, and we pay in cash. As far as pelican state junk car buyers go, you won’t find anyone more generous and expedient than us. Once you’ve made the deal, we’ll swing by and grab the car. No matter whether it’s monsoon season or the week after Mardi Gras, you won’t have to lift a finger with our junk car removal service. How Much Is My Junk Car Worth In Louisiana, And Why? Your junk car in the Sportsman’s Paradise State will be worth different amounts of money depending on its condition. A bayou dwelling clunker that is still drivable will net you a fair amount of money. Even if it’s fully rusted, the spare parts can be useful. We’ll hand you between $100 and $300 for these cars. True junker cars won’t even run. They’ll still be useful to sell for scrap metal, though. You might not get that much cash, but you probably got a lot of mileage out of the car. We typically pay out the going rate for scrap metal, minus towing fees for the most broken down junkers. Cars that are still looking decent and in working order can be taken off your hands too. We’ll even pay you up to $15,000 if the car is nearly ready for resale. You can use your cash payment to buy a new ride! 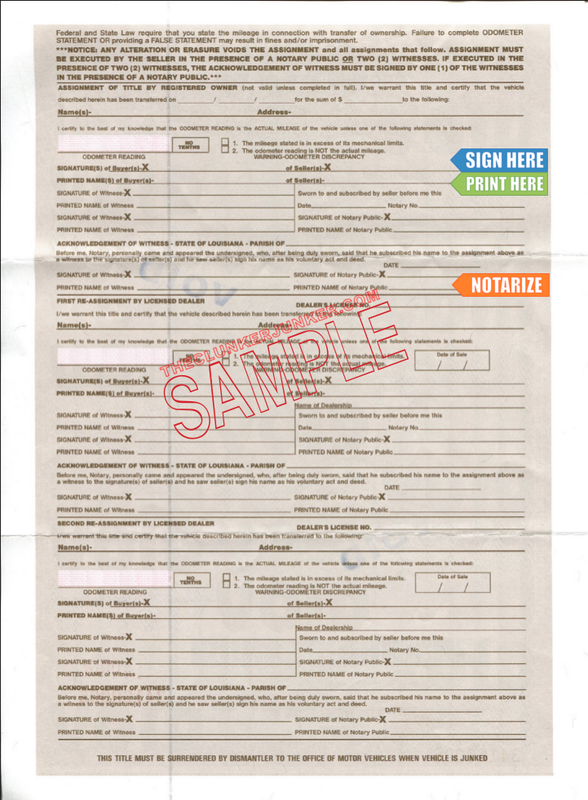 Required: The state of Louisiana requires that all titles are signed in front of a notary public! 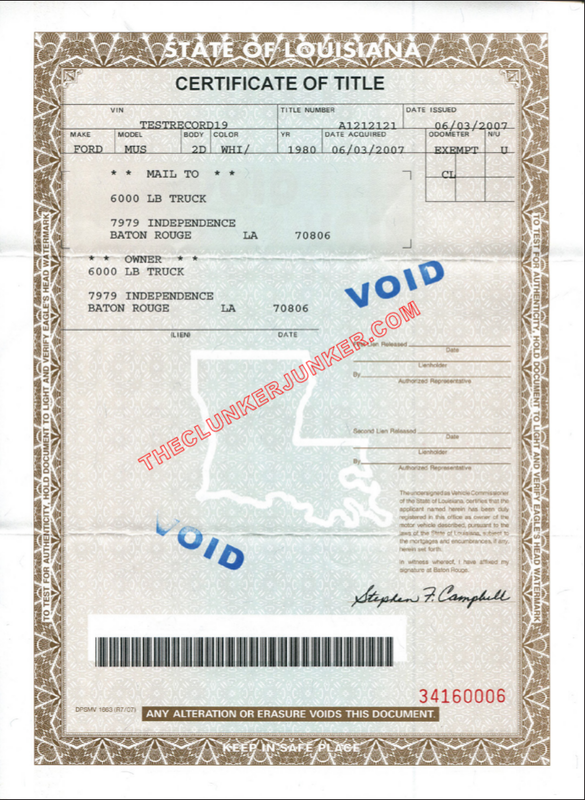 We have put together a simple guide and example for how to sign your Louisiana title when you are selling your vehicle. If there are multiple owners listed on the title, they must all sign the title unless the names are separated with "OR". On a Louisiana title, you will want to sign and print on the back of the title in the section that says "Assignment of title by registered owner". Never write anything in the "re-assignment by licensed dealer" sections. First sign the back of the title where indicated by "Signature(s) of Seller(s)". Print (don't sign) your name on the back of the title where it reads "Printed Name(s) of Seller(s)". Fill out the Louisiana vehicle application. Complete the "Duplicate Title Affidavit" section. The fee for a replacement Louisiana title is $18.50, plus an additional $8.00 handing fee. Getting rid of an abandoned vehicle in Louisiana can be a difficult process. Unfortunately, you cannot just sell any junk car that ends up on your property if you do not own it. You'll need to follow the Louisiana abandoned vehicle removal procedures. We have given a general overview of what that entails below. Contact your local law enforcement office to have them affix a (24) twenty-four hour notice of removal on the vehicle. If the vehicle remains on your property for longer than (24) twenty-four hours, it may be towed and stored as law enforcement seeks out the legal owner. If the vehicle has remained unclaimed by the registered owner and/or lien holder for a period of more than (3) three months, it will be sold at auction or destroyed, determined by an appraisal. If sold at auction, the new owner of the vehicle may apply for the title. Do you buy cars in Louisiana without titles? Sometimes, yes! Your vehicle will have to be older than 2006 and you’ll be asked for proof of ownership. This is generally a registration or insurance card that matches your photo ID. Offers without title are generally lower than if you had a valid title. We do not guarantee that we can buy every car in every city without titles. Louisiana often changes their title documents from year to year. If you have questions about your specific title, please contact your Louisiana OMV. Yes, unless you are transferring the plates to a new vehicle. You can return the plates to your local OMV office. 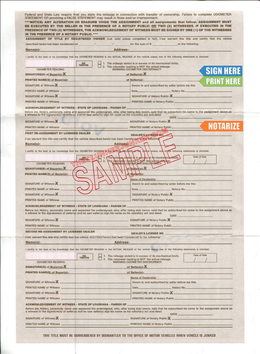 Fill out the Notice of Vehicle transfer online form. Now, if you’re ready to sell your junk car in Louisiana, reach out to The Clunker Junker. No matter where you are in the boot, we’ll find you and make a deal on the spot. No delay, no trouble, no negotiating. We’ll help you to sign the title and duplicate it if necessary, too. We’ll rapidly send someone over to remove your junk car. You’ll get a wad of cash. You’ll get on with your life, and use the cash to buy a new car. Why wait? "The vehicle was in a crash, so there is damage to the front of the vehicle. I haven't been able to get the hood up, and the windshield is cracked on the passenger side. Both airbags are out. It still runs, but it gets hot quickly. I'm trying to get at least $500 cash for it. I'm trying to junk it to try to get a new car. " "The vehicle is driveable, but it needs new brakes and drive axles. While it can go short distances safely, it really shouldn't be driven long distances. " "The vehicle recently was working and driveable, but it sustained some mechanical damage that will not be repaired due to the cost. Otherwise, it's in good condition inside and out." "The only thing wrong with this car is a head gasket has been blown. Everything else on the car is in excellent condition. I'm upgrading to a new car, and I'm looking to junk this one for $300 cash. Thank you." "I was in an accident in this car, and I have since been told that I will not be covered for the car which is totaled. I'd like to junk it and get as much cash as possible for it." "The car runs but has lost oil pressure and is blowing smoke. The transmission was rebuilt six months ago. The body, interior and glass are in excellent condition. There's very minor damage to the right front corner of the bumper, and the headlight and turn light are undamaged and working. It has alloy wheels and all-terrain tires with a good spare tire. The car was my daily driver until yesterday. The interior is complete, and nothing is missing. " The Clunker Junker is one of the top junk car buyers in the state of Louisiana. To date we have made instant offers on over 10 thousand vehicles across the state, totaling over $4.3 Million offered! Of those vehicles, approximately 14% were purchased without a title. We also buy cars on a wide spectrum of conditions and 61% of the vehicles we've made offers on in Louisiana do not start or drive. Many also have moderate to severe body damage. New Orleans in Orleans Parish was our top producer, followed by Baton Rouge.